The Amazon Kindle Paperwhite reigns supreme among e-readers, but it’s not resting on its laurels. This year’s updates include water-resistance so you can enjoy a novel while walking in the rain, lounging in the pool or relaxing in the bathtub. The minimum storage space has doubled to 8 GB, expandable to 32 GB. New Audible tech enables Bluetooth wireless headphone or speakers. All that and more for $129.95. The AmazonBasics Microwave Oven ($59.95) can be paired with an Alexa-enabled device for voice control of popcorn popping, potato baking, leftovers reheating, etc. It’s rather small (0.7 cubic feet) and underpowered (700 watts), but with Alexa you can order more popcorn and save 10%. Amazon is deeply discounting its Fire family of streaming video devices. The Fire Cube, normally $120, is going for $60; Fire TV Stick is $24.99, regularly $39.99, with the 4K model ten dollars more; and the $229.99 Fire TV Recast DVR device is only $179.99. Shopping for a new big-screen TV? The 55-inch TCL Smart LED TV (4K HDR with built-in Roku) normally sells for $600 but is on sale for $350. Need portable sound? Check out the highly rated Ultimate Ears WonderBoom Wireless (and waterproof) Bluetooth Speakers: only $50 vs. $100 list price. This speaker goes wherever you go, even in the pool, and has 10-hour battery life. Looking for a new laptop? Starting November 20, the newest 2018 model of the Acer Aspire 5 laptop with loads of goodies will be only $500. It sports a 15.6-inch screen, an Intel Core i3 processor, 8GB of RAM and a 256GB Solid-state hard drive. The rich sounds of Bose SoundSport Wireless earbuds will be $100 ($50 off list price) at Walmart. Walmart’s Black Friday deals start at 10 p.m. ET on Wednesday, November 21; in-store deals start at 6 p.m. Thanksgiving Day. Google Home Mini and Chromecast are the cheapest combination for adding voice control to your TV. Walmart will have this bundle for $45, saving $29 off regular separate prices. The Roku Ultra 4K HDR streamer is now $99. This is Roku’s top-of-the-line streaming media device. It comes with $39 JBL headphones at no extra cost, a new headphone jack on the remote, and a remote finder. 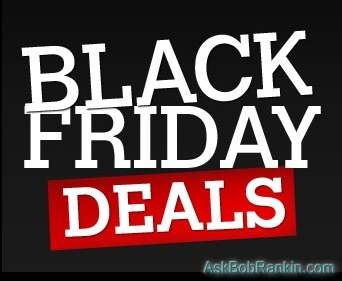 Most recent comments on "Here's Your Geekly Black Friday Preview"
Hi Bob. Clicking on your link to the Home Mini & Chromecast special, I'm seeing that it's $74. Is there something that I'm missing? Ron, Too soon? Here's a segment from Bob's article several lines above the "Home Mini" deal: Walmart’s Black Friday deals start at 10 p.m. ET on Wednesday, November 21; in-store deals start at 6 p.m. Thanksgiving Day. Thanks Daniel. Yes, it's listed now. I only use Ethernet for my home network and have been wanting to get an (Ethernet equipped) Roku Ultra for quite a while. This is a bargain that I couldn't pass up. Thanks again and wishing you a great Thanksgiving weekend.